Olivier Giroud insists his “story is not over” at Arsenal but revealed he came close to leaving the club during the summer. The France international has come off the bench in all the Gunners’ games so far this season having fallen behind club-record signing and compatriot Alexandre Lacazette in the pecking order. Danny Welbeck also seems to have surpassed Giroud in manager Arsene Wenger’s thinking but the 30-year-old striker is likely to get a rare chance to impress from the start in Thursday’s Europa League clash with Cologne. 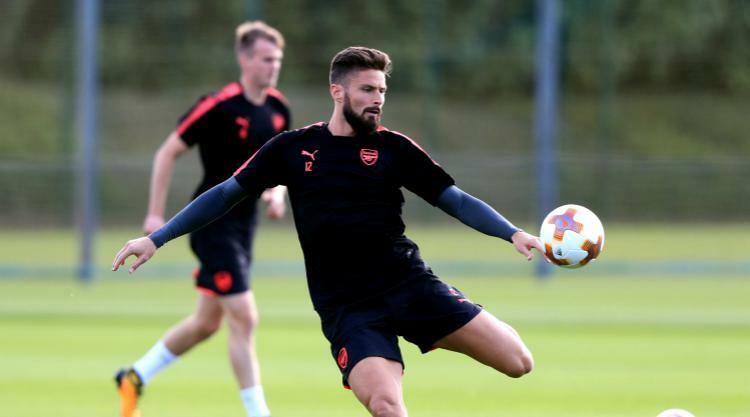 Wenger will make a raft of changes as Arsenal play in the competition for the first time in 17 years, with Giroud expected to be one of several alterations. Giroud – who scored a late winner on the opening day Premier League win against Leicester – has struggled to hold down a regular first-team place at the Emirates Stadium and admits that he nearly quit over the summer having been linked with the likes of Everton and West Ham. Asked how close he came to leaving Arsenal, Giroud said: “Actually that’s a very private decision because it’s true that I was close to leaving the club because I said that I wanted to play. “But after a big reflection with everybody around me, like my family and my close friends, I (decided I) wanted to stay at Arsenal and I thought the story was not over, (not) finished at Arsenal. Wenger has always maintained his desire to keep Giroud – who has 99 goals for the club – at Arsenal and was full of praise for the striker on the eve of the Cologne clash. “I have said many times that his contribution has been huge,” he said. While Giroud wants to stay put, full-back Mathieu Debuchy has revealed he was unable to leave during the transfer window despite being told he could depart for free. He was reportedly set to sign for Nice before the deal broke down and he remains at Arsenal until January at the earliest. “I don’t know what will happen because this summer the coach (Arsene Wenger) would have let me leave without a transfer fee,” he told L’Equipe. “Brighton also enquired in the last few days of the transfer window. But that came to nothing.